The 25 foot row of peas is finished for the year. The vegetation was removed and shredded in the 10 HP MTD Chipper/Shredder and deposited in the compost pile. Vegetation shreds easily if a bit of green is still left on the vegetation. The shredder is ideal for a home garden and facilitates removal of spent vegetation and creates a small amount of compost. 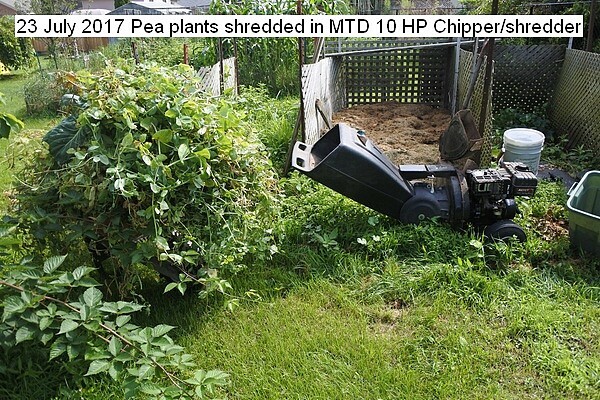 This entry was posted in Uncategorized and tagged 23 July 2017 Pea Plants Shredded, Composting, Pea Plants Shredded. Bookmark the permalink.